I thought I’d do a planning session trip report for anyone who hasn’t had theirs yet, just cuz I found them so helpful when I was first planning my wedding. I was really excited to be at Walt Disney World having my planning session and very appreciative of the opportunity. I never dreamed we’d have a Wishes wedding, so I never thought I’d get to do a planning session. However, I was disappointed with some aspects of it – maybe because I’d built it up so much in my head, but also because the Wishes wedding is a big financial deal for some of us, and I thought the experience could have been a lot better for what one pays to have a Wishes wedding. So I apologize for griping a bit in my trip report – I just want to give my honest impressions. We flew out from California for three days to meet with our planner and choose between the two sites we liked in Epcot: Japan and Morocco. I won’t bore you with the details of the rest of the trip, but here’s what happened on our planning session day. That morning, our sales manager drove us backstage at Epcot (very cool!) We knew almost immediately that we wanted Morocco – Japan has a very weird setup now that they’ve planted 2 trees right in the middle of the walkway. 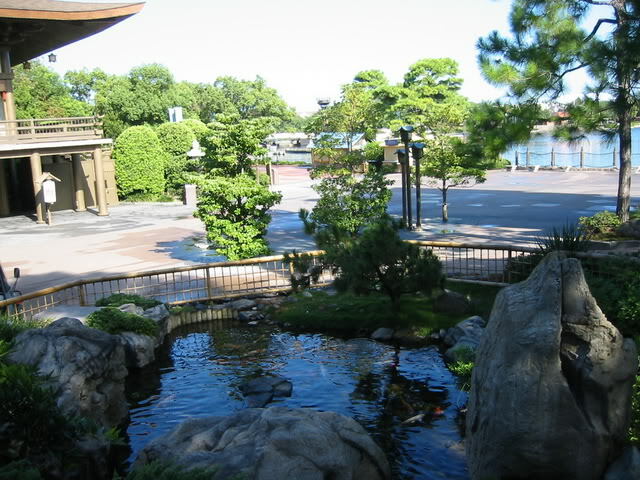 We would have been up on the bridge, separated from our guests by a noisy waterfall (which meant we’d need microphones), and our guests would have been all squeezed off to one side of the koi pond. 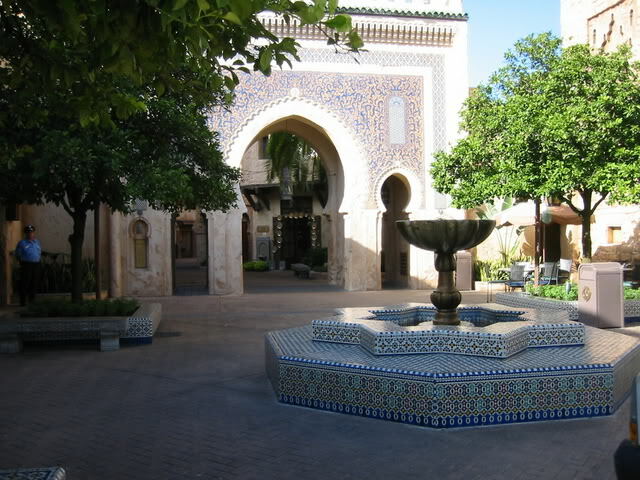 Morocco has several neat areas that could be used. I wanted to have the altar be the fountain in the courtyard, but that would have put our guests out on the main walkway, and apparently the Segway tour comes through there right in the middle of our ceremony. Even in our new spot – between the fountain and the archway – our wedding planner couldn’t guarantee that the Segway tour wouldn’t come by. It was really cool to get into the park from backstage and to see the sites in person (I hadn’t been to WDW in 15 years). Our sales mananger was very good about coming up with options for staging the ceremony and didn’t mind that I wanted to time the walk to the altar in a bunch of spots (so we can edit our music accordingly). However, we were informed just that morning that our site visit would be cut short by half an hour because the chef at the Boardwalk wanted to move our tasting up. This meant that we didn’t get to see our dessert party location, which really bothered me. We had to take Upper UK because when we switched our dates forward 2 weeks to avoid President’s Day, Lower UK had already been reserved by a corporate event. Upper UK has a bunch of umbrellas at its tables, and I am worried that they will block our guests’ views of the fireworks. (We didn’t have park admission, so we couldn’t go into Epcot on our own later to check). So then our SM drove us over to the BoardWalk convention center to see our reception site, the Attic, and meet our wedding planner for our tasting session. We went into the DVC side of the BoardWalk Inn, and our SM walked us down the 15-mile hallway to the Attic. 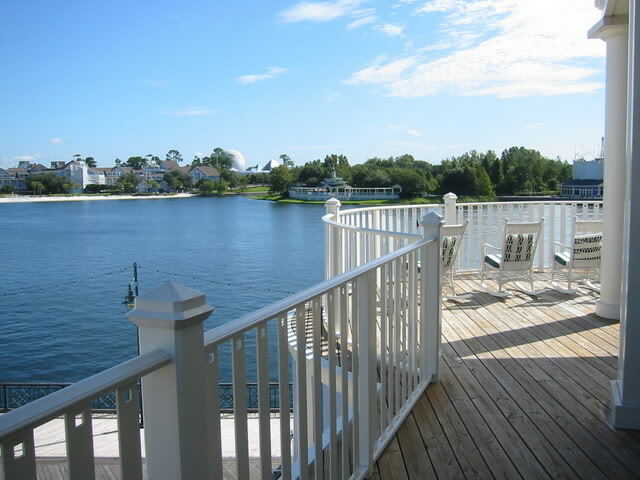 The view of the lake and the Boardwalk is amazing, and I love the covered deck and all the windows. Plus, it just felt right for what we were going for – a casual family get-together. Oh, and the floor is really shiny! I counted all the tables (4 inside, 5 outside) and measured them for reference for the centerpieces. We talked to our SM about where we could put the cake, the sweetheart table, and the iPod, and we took pictures of those places. It’s a good thing we did, because when we met our WP we were immediately told we couldn’t use any of those places. However, our WP eventually relented when we showed her our pictures and explained that our SM said it would work. After our SM passed us to our WP, we went into one of the BoardWalk ballrooms for our tasting. Apparently only Epcot and Grand Floridian weddings get to have their tasting sessions in the kitchen like they show on that Disney weddings TV special. The chef met us in the ballroom. He was polite, but he acted like he’d rather be somewhere else and took off as soon as the dessert course was served. 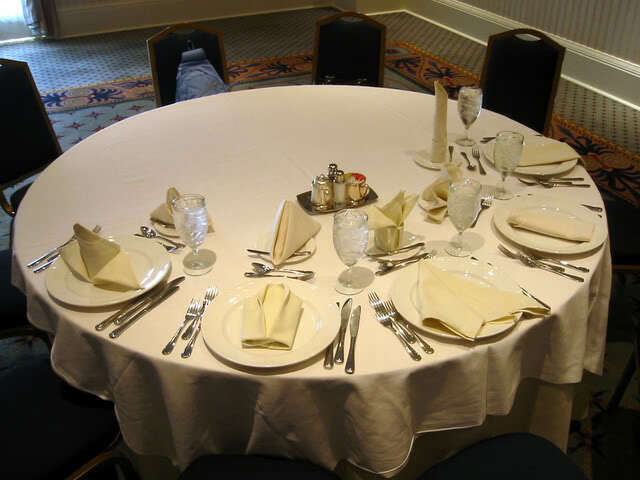 The first thing they had us do was pick which napkin fold we wanted. Since we’re doing a buffet, we won’t have chargers, so that eliminated a lot of the choices. Our server was Brenda, a banquet captain, and she was the sweetest lady. She treated us like royalty (and we later learned that she has actually served royalty at Disney!) and did more to make me and Patrick feel at ease than anyone. As soon as our appetizers were served, our WP began peppering us with questions about the wedding. I had been under the impression that we’d only be talking about food at the tasting, and we’d leave the other details til the session at Franck’s. Instead, we were making major wedding decisions while trying to concentrate on the food. For instance, our WP wanted to know how Patrick and I were planning to get back to our hotel following the reception. I asked if we could talk about that when we covered transportation back at Franck’s, but we were told we had to decide right then. It wasn’t until our tasting was almost over that our planner began to warm up. I think once this WP is on your side, she is a good planner to have because she will make sure your wedding runs like clockwork. I am not sure whether our WP is on our side yet, but she really got what I wanted to do with the music during the ceremony, and I know she will make sure the sound tech does it right – something that’s really important to me. 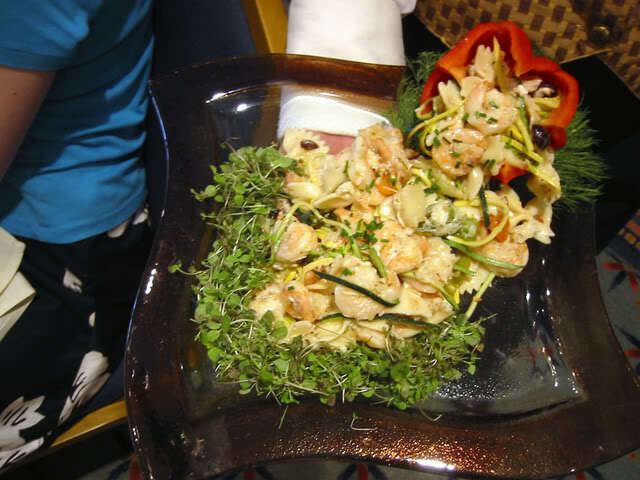 OK – back to the tasting session: After we tried the appetizers (crab rangoon and bacon-wrapped scallops), they brought out our two salad choices, first the mixed field greens and then the seafood salad. 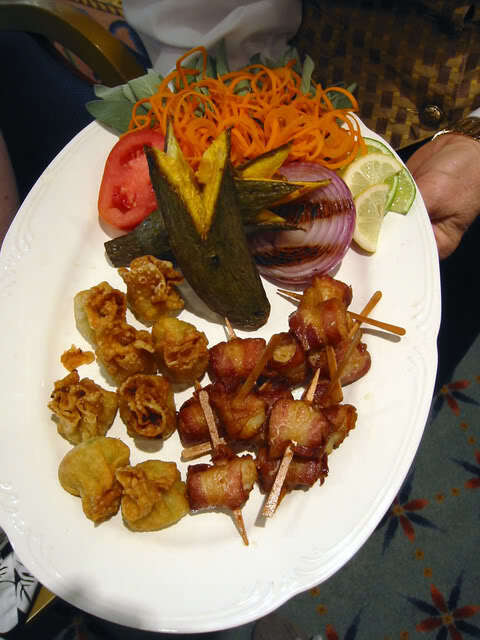 The appetizers were OK, but were typical hotel-buffet quality. The salads were beautiful and good. I thought the main courses were just average. The parmesan-crusted chicken was bland and didn’t taste like parmesan, and the basil-mashed potatoes didn’t taste like basil (even though I could see it in there! 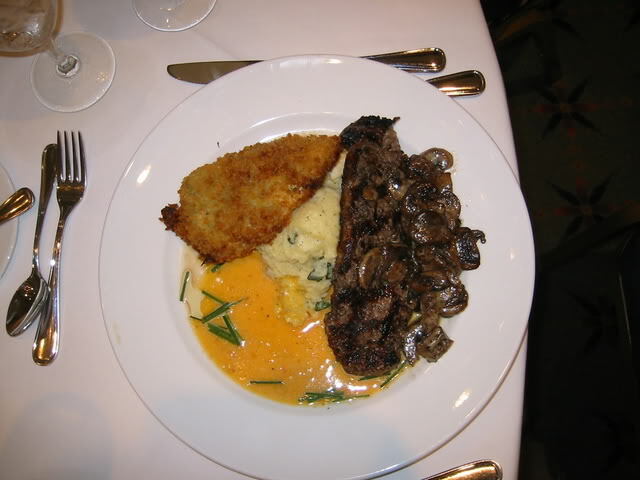 )The filet was kinda chewy and gristly, and the tomato hollandaise was bland. The mushrooms were fantastic though! Last we tried the Cinderella Slipper dessert. I asked for it because so many people on the DIS rave about it. 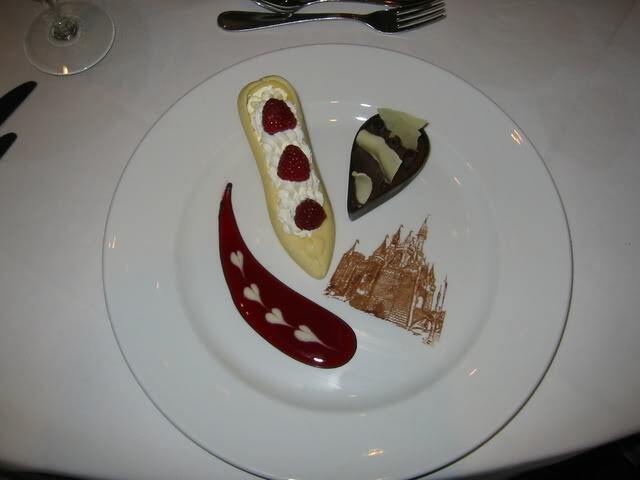 It must be because of the presentation, cuz the mousse and the white and dark chocolate were pretty average. However, knowing what a hot commodity it is, I asked to take one of the spares with us! (They made 2 extra in case ours were damaged in transit). Before we finished (and after the chef took off), our WP had to go make a phone call back at the office in Celebration, so we had to get ourselves back to Franck’s. We did the bus routine and met there about an hour later. I was looking forward to this part of the session, and I think it was a little less hectic than the tasting session. First our WP asked us about transportation. We were really confused about how all that works – getting us to the ceremony, getting the guests there, getting them to the reception, getting us there, etc. The big sticking point turned out to be this ridiculous 5-hour (consecutive) minimum for the charter bus. When you do just about anything in Epcot, you have to bus guests in. You can do a one-way or roundtrip bus that just picks people up in one spot and brings them back there, but our guests are staying all over the property, so we have to charter a bus. Five hours of bus is not long enough to cover an entire ceremony and reception, but it’s not short enough that you can afford to have the bus come twice. We really only need the bus for 2 hours at the beginning to get everyone there and then 2 hours at the end to take everyone back. But we’re required to do 5 hours, which ends right in the middle of our reception and forces us to add on hours (not to mention we have to sign up for another 5 hours to get our guests to and from the dessert party that night). I think that’s pretty sneaky to set it up that way. After we set up a schedule for the @#$%! bus, we talked about the order of the ceremony and pictures, then the cake. Thank goodness our planner liked the custom cake we brought pictures of – it was the first time we’d been given approval for anything we wanted all day! Then Rose from the Disney Florist came by to talk about flowers. (Rosie is the Disney florist who works with Escape weddings, and she works out of her home in the Midwest. Rose is an on-site coordinator for Wishes wedding floral.) She had these neat sets of cards that showed flowers by color, and she sketched our photo of the ceremony site to help her do the arrangements. She also had big books of chair cover and sash fabric swatches. I didn’t want chair covers, I just wanted to rent the $5 wooden chairs to replace Epcot’s black plastic monstrosities. However, the delivery fee on the wooden chairs is more than double the cost of the chairs, but chair covers can be put on for $8.50, so… covers it is! I also met with more rejection here, but it was couched in nicer tones. The flowers I wanted for my bouquet are out of season, the petals I want for my aisle will probably blow away, and Disney has no props or plants they can rent us for the altar – we have to buy spendy floral arrangements. (Patrick only half-jokingly suggested we bring our own 5-ft urns to place by the archway. From California. On the plane.) By this point I was staring to be overwhelmed and burned out, so I just picked a bunch of expensive centerpieces I’ll be cutting out later. The last thing we did was try cake. 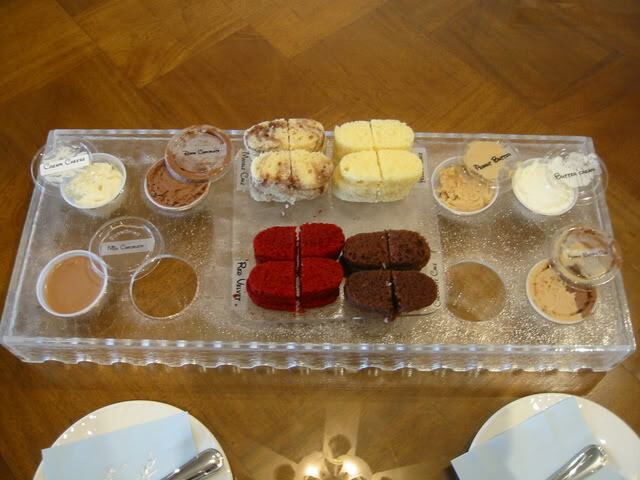 I appreciated that they’d arranged to have the specific flavors we wanted: chocolate, vanilla, marble and red velvet cake; peanut butter, peanut butter cup, cream cheese, chocolate, dark chocolate and buttercream fillings. Everything I’d heard about the fillings on the boards was pretty much true: the peanut butter was good, the milk chocolate didn’t taste like anything, the red velvet cake was dry, and the cream cheese frosting tasted like it’d picked up the flavor of whatever else was in the fridge. DF also found the chocolate bland and the marble cake boring, but he liked the red velvet and cream cheese, so it really is all just personal taste! As we bit into our first piece of cake, our WP announced, “You’ve planned your wedding!” That is something I love about the Disney’s Fairy Tale Weddings process — you only have to make mostly the fun decisions, like cake flavors and flowers, and it’s all taken care of so quickly. We were told our BEO (Banquet Event Order) would be ready in about 2 weeks, and Rose said our floral proposal would take 2 to 3 weeks because she wanted to try to get my out-of-season flowers – that was nice! Hello…we are in the very beginning stages of planning a Wishes wedding for our daughter and have an appt next week with a WP to begin the process……it looks like your e-book has a wealth of information…I am trying to buy it online but keep getting a page error. Any ideas on how to get it to work so we can read it before our meeting? Thanks so much! Hi Christine! When is your meeting? I am working on a new way to distribute my book that *should* be ready early next week, but let me know exactly when you need the guide by and I’ll try to figure out a way to get it to you. Hi again! The new version of my eBook, Carrie Hayward’s Fairytale Weddings Guide, is now available for purchase in my new shop! Hopefully there’s still enough time before your meeting for you to read through it! Would anyone be able to give the email of one of their Disney wedding planners? Emailed the general email they give us and have not heard back! Hi Stephanie! It’s my policy not to share cast members’ personal emails publicly, but really the best way to reach them is to call. Can you use Skype so it’s cheaper? I just want to know if I can even afford to give my daughter a wedding at Disney. And how much do u have to pay up front? Where is the Attic located at Disney? Hi! I just got engaged and my fiancé and I are planning a Disney wedding. However, we don’t know how much it will cost for our guests. We live in Ohio so flying there is the best option. We would love to put everyone at one of the value resorts, but we want to stay somewhere else. This is our dream wedding and if some of his relatives can’t go then we won’t be able to have it. I put a request in to Disney to talk to them and am waiting to hear back, but I want a first-hand account of someone who has done it. We’re thinking that our guests will only have to stay 2 nights to keep costs down. We’re planning on doing the Wishes package. Thank you Thank you for this page! For me being in Canada it has been almost impossible to find any info on Disney weddings, so finding this page was like hitting the DW lottery!! In order to have a DW do you have to stay at a Disney resort hotel? and if so what is the minimum stay. Also besides price and guest count what is the difference between the Wishes Collection and the Escape Collection? I did notice that I think the Wishes collection included a reception but the escape one does not..
Hi Elisa! Only the Memories and Escape packages require you to stay at a Disney-owned hotel. If you choose Wishes, there is no stay requirement. Escape is a package that includes tax and service fees and has very little flexibility. You can add a 2-hour catered meal to the Escape package (no DJ/dancing) and/or you can add a dessert party. Wishes is not a package – you choose all the elements a la carte and they have to add up to a certain minimum expenditure. Tax and service fees are extra. I have complete details on all three packages, including pricing and what your options are, in my book, PassPorter’s Disney Weddings & Honeymoons. The e-book version comes with free updates for life and a whole chapter of interactive planning pages that do things like calculate your entire budget and tell you how much tax and service charge will cost. I also have a weekly podcast devoted to Disney weddings where I interview couples and industry experts. You can use Categories to view all the Escape interviews, all the Wishes ones, etc. Do children count in the guest count? I am looking at an escape wedding however there are alot of children in our family it puts us above 20..
Children ages 3 and up count. What you might do is hire a Disney-approved in-room sitter like Kids Nite Out and have them watch the kids in someone’s hotel room during the ceremony. A Friday for the Escape package. I know the Wishes brides get priority but how do they decide even their dates? I’m still deciding between the Wishes or Escape package. Wishes couples can book 12 months out. If they request a venue-date combo before 12 months out that conflicts with other requests, they are put into a lottery that occurs 12 months to the day of the date they want. That whole process is explained in my PassPorter Disney Weddings Guide. Escape couples may then book whatever’s left at 8 months out. 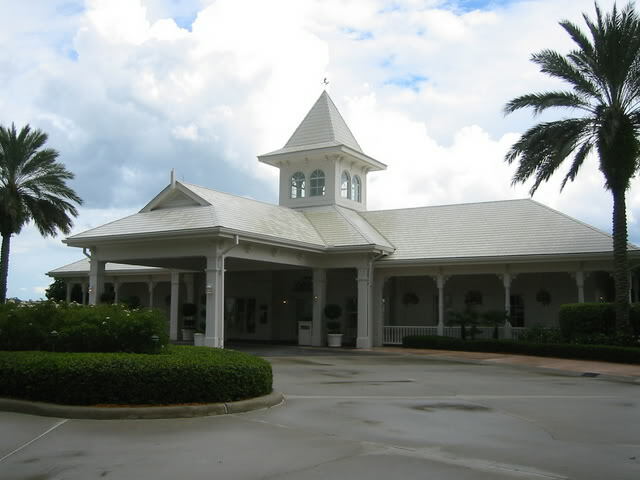 In many case, there is no competition for dates – for example, the Yacht Club Gazebo is not very popular, and if you’re booking during an unpopular month, like September, it’s even easier to get. What time of year and venue are you looking for? Hi! Love your blog and all of your great advice. I’m sure my question is mentioned somewhere so I’m sorry in advance. But I want to know how Disney goes about giving you your wedding date? I have a specific date set in mind and I’m worried on whether or not we will get it since there are so many Disney Brides. So if you can help please do! I’m freaking out lol. Hi! It depends on what kind of wedding you want, what time of year and day of the week, plus the location. Let me know and I’ll see if I can give you an estimate of where you fall on the Worry-o-meter! My son is planning a wedding for October 31 , 2015 . How do we get the pass porter guide for the fees etc for the wedding . We are in the planning process and want to work within budget . Thanks for your help Carrie ;). Please let us know how to get started . Congratulations on your son’s impending nuptials! You can purchase the e-book and print versions of the PassPorter by clicking here. I recommend the e-book version because you get free updates in perpetuity, and it has an interactive budget worksheet that will show you which of your expenditures apply to Disney’s minimums and exactly how much tax and service charge you’ll pay. You can also use the discount code in the back of the e-book to save 30% on a print copy of the book if you want one! Hi Carrie! Absolutely love everything you post and have seen you all over the DIS boards (big time lurker) I’m getting married at Sea Breeze Point in November and am looking at the Attic for our reception before we do a dessert party in Epcot that night. Since it’s the weekend I’m waiting to hear back form my coordinator but I was thinking you could maybe help me on what the minimum expenditures are for the Attic. I read one place it was $1500 another said $2500 so just trying to get a number. Hi there! Thanks for the kind words! The Attic has a $1,000 food and beverage minimum for events ending before 5pm and a $2,500 minimum after. I don’t know if you have the Passporter guide, but Chapter 3 has the venue fees and food and beverage minimums for every reception location (and more info about the Attic, if you’re interested!). We was hoping to book the wedding pavilion. I’m just a bit scared that it will be at Easter when the kids break up from school so don’t know whether it will be busy. I’m just hoping that we can get in if we’re flexible with the dates. If you’re flexible, you’ll have no problem. The good thing about spring break is that everyone’s is a little different, so it’s spread out over several weeks, not all at once like at Christmas or 4th of July. Also, that’s not one of the most popular times of year to get married at WDW, so there shouldn’t be as much competition as there is in, say, October. Were looking to get married at Disney in April 2015, and was told that we couldn’t book the wedding until August 2014 because of the type of package we’re having. My only concern is that my family and friends would need to book the holiday before the wedding is booked and I’m scared that come August, we won’t be able to get our desired wedding. Have you ever come across this happening as we would be coming from the UK so don’t want to bring everyone across if we can’t get in Disney. Hi Katie! You aren’t able to book the Escape Collection more than 8 months out, but if it helps, you can get “penciled in” 9 months out (meaning that they make a note of the time and locations you want but don’t reserve it). I know it can be stressful for UK brides due to all the planning you have to do. However, often you guys plan extended holidays in the US, so if you can be flexible with time and day, you will have no problem booking the wedding during your holiday. Ususally Escape brides have no trouble getting at least the day they want—which location are you hoping for? The Yacht Club Gazebo, for instance, is less popular and very easy to book. Hi just curious what is the actual mim cost of a disney wedding… this would be my 2nd wedding to yes the same man! We have a daughter and we have looked at things like eloping in hawii and vegas but I just think it would be so much more fun if we could take a family trip with our daughter and closets friends and family just trying to wrap my mind around an actual number before I spend any money on the book or anything else! any info would be greatly appreciated! 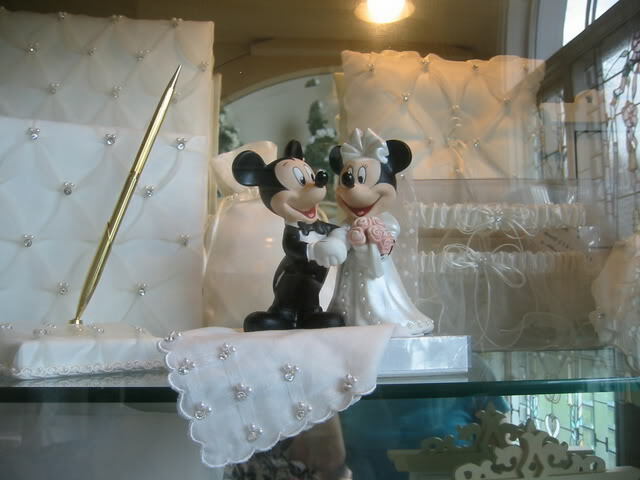 At Walt Disney World, the smallest package, the Memories Collection, costs $2,495 and lets you have up to 6 people (including the bride and groom). The Escape package starts at $4,925 and lets you have up to 20 people total. Above that, there’s the Wishes Collection, which isn’t a package, it’s an a la carte experience where you add elements until you’ve spent a minimum of $10,000. You can see what’s included in the Escape and Memories packages HERE. Hello just wanted to know if couples are able use outside florist ,band dj and photography when use the Wishes package? It depends on the location for DJ and florist. Outside vendors of these services are only allowed at convention center venues. Non-Disney photographers are now allowed at all venues, even inside the parks. Which locations are you considering? Thank you so much for writing your book. My fiancée and I had a really hard time finding dftw information until she found your book. We have a couple questions. 1. We noticed the print edition was published in 2010 and the ebook in 2013. I purchased the ebook, but my fiancée would like the actual hard copy. Do you know when the 2013 hard copy will be available? 2. We are considering the attic as a possibility for our reception. We’ll have 28 people total, and we noticed that the attic capacity is listed as 36 for outside and inside combined. If the weather is not cooperative, can all 28 people fit comfortably inside? Hi Cliff! I’m so glad you’re finding the book helpful! The way my publisher does things, the printed version of the book is only replaced with a newer one when all the current print copies have sold. However, you’re in luck because a new version should be going to press soon, and I will try to remember to update here when it’s available. As to the Attic, they actually lowered the max guest count there to 36 a couple of years ago to take into account the reduced capacity when it rains. I definitely think 28 people will fit inside comfortably, and since the patio is covered, it can still be used as long as it isn’t bitterly cold and/or windy. Is it possible to have a Disney wedding at a site other than Disney World? We are in the early stages of planning and I am not very impressed with any of the locations, except for the ones that you can use only early in the morning. My daughter doesn’t want a morning ceremony…. 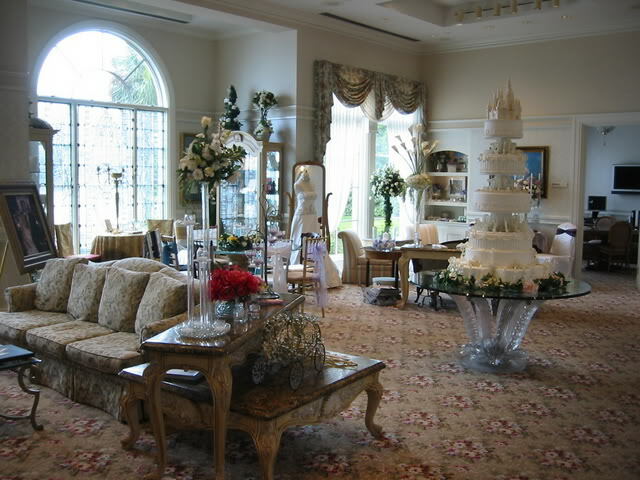 Disney’s Fairy Tale Weddings are only held on Disney property. You can do an offsite ceremony and an onsite reception, as long as you meet the minimum expenditure requirement. You can also do a DFTW at Disneyland or in Hong Kong. But there are no non-Disney locations for official DFTWs. Could she do a Disney-themed wedding at home? 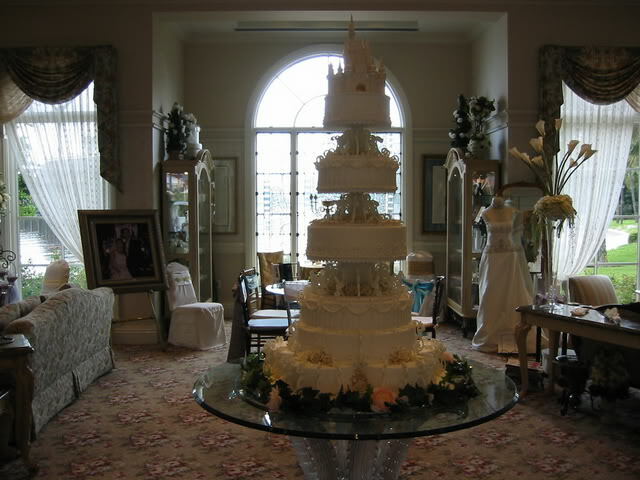 Or how about a Swan & Dolphin wedding? That would be on property but perhaps would have a location you found more appealing. There’s also Rix Lounge at Coronado Springs. It’s not run by Disney, but you can have your wedding and reception there. You can find podcast episodes about these places on THIS PAGE and photos linked from THIS PAGE. Hope this helps! Hi Carrie! I’m trying to download your e-book from that link, but it appears to be broken? Do you have an alternate link? Thanks for all of the helpful info! Just bought it! The link seems to work now; thanks! My daughter is trying to plan a wishes wedding..I am concerned abut meeting the room accommodation for the guests..it says for 41-75 guests you have to reserve 75 rooms… I do not see any way we can fulfill that number..any way around this or thoughts? I can not see paying for rooms not used..
Hi Janice! The minimum number of room nights (not rooms) you need to book in order to have a room block is actually 10, but Disney doesn’t like to advertise that. The 75 room nights is more of a suggestion based on their hope that every single one of your 75 guests stay at a Disney-owned resort. Your daughter might be interested in a copy of my inexpensive e-book “PassPorter’s Disney Weddings & Honeymoons,” which has complete details about every aspect of the process that you just won’t get from Disney’s web site or Disney until after you sign a contract (including the lowdown on the room block and tons of money-saving tips). I found this in my frantic search. Last August I took my sister and daughter with me for a meeting with a WP, Diane, to choose a site for my daughter’s wedding. We had the same problems you did. Everything we wanted was nayed…nixed. The chartered bus to Epcot was absurd as well as the almost $3 per guest viewing fee for fireworks if the location was in a place any guests might see the fireworks. I guess I was disillusioned to put it mildly. I also thought they were not very gracious. I wonder if I had lots more money to offer if they would have been more willing to be creatively helpful. The backstage entrance to Epcot was not the most attractive place to drop off guests. We decided to try to go with The Swan or The Gaylord Palms off of Disney. The Swan was not getting back to us and between their not being available due to vacations and what not we decided against that. The Gaylord Palms seemed ideal since it is right outside of Disney’s gates and their atrium is great because it is climate controlled being indoors but feels like outdoors and is beautiful. 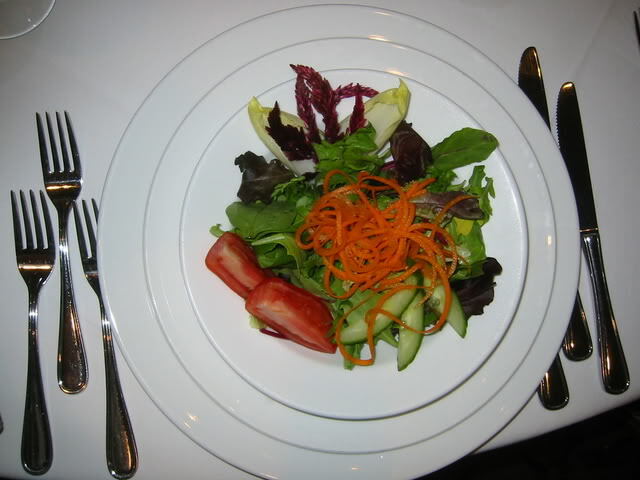 They were well out of our budget though at $185 per guest for a plated meal. Now we are rethinking the whole thing. Disney’s brunch is an affordably priced meal for our approx. 100 guests and fits into our budget. I didn’t notice a date on your page here but I wanted to know if your wedding was past and how it went . . . and if you have any advice for me. 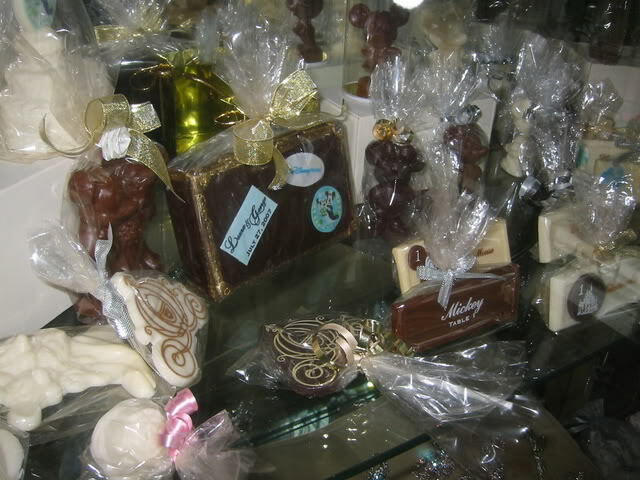 I am more discouraged now reading here that the food and cake was not great at your tasting. I would have expected it to be amazing…after all it is DISNEY!! Wow am I discouraged and so overwhelmed on the verge of tears. I would be so grateful for your insight and wisdom. Thank you. Hi Donna! I’m so sorry to hear about your crummy wedding-planning experience, and I definitely don’t want you to be on the verge of tears! Let me see what I can do to help out. If you and your daughter feel that a Disney wedding might be right for her but didn’t feel that things clicked at your last meeting, I would suggest trying again but requesting a different planner. There are many happy brides and grooms out there who had can attest to the fact that it is possible to get a planner you really click with. Disney does have a lot of fees and restrictions, but different planners have different approaches, and many of them are really good about helping you work within the restrictions to pull off your vision. Some of them are even proactive about coming up with better alternatives that you might not even have thought of. For example, although a charter motorcoach backstage at Epcot IS very expensive, there are several smaller, cheaper options, like 8-passenger and 11-passenger vans or a minibus. We were never given these options, which is why I have detailed all of them in my Disney’s Fairytale Weddings guidebook.